Swimming pool cleaning has never been an easy task. It is a crucial routine that helps to keep your swimming pool safe and looking elegant. You just need to hire the experts to have your pool efficiently cleaned. Swimming Pool Singapore's pool cleaning services are customized to meet your needs. Our technicians are highly-trained and experienced to offer exceptional pool cleaning services. We always employ the latest techniques in the industry to provide the best services to all our esteemed customers. We have received many positive testimonials from thousands of satisfied customers. We are ready to answer any burning question about professional swimming pool cleaning services. What is Included in a Typical Pool Cleaning? It is important to test the pH and correct it so as to maintain the ideal pool water balance. This test is a vital routine that should be done at least once a week. Acid level testing involves measuring the acidity or alkalinity of the swimming pool water. A pH above 7.0 is considered alkaline, 7.0 is neutral, and below 7.0 is considered acidic. The recommended PH for a swimming pool needs to be within a pH range of 7.0 to 7.6. What happens if your swimming pool is too alkaline? If the pH is too high, swimmers will experience burning sensations in the nose and eyes and the skin will also get dry and itchy. As the alkalinity increases, the ability of chlorine to act on pathogens is compromised. Your sand filter will also be unable to trap dirt. In high pH, the calcium carbonate usually plates out on the sand in the pool filter, quickly turning into cement. The swimming pool also loses its sparkle and becomes murky or cloudy. Calcification will also be common at the waterline since the calcium in the pool water usually combines with carbonates forming scale at high pH. What happens if the pool is too acidic? Our skin becomes dry and itchy, swimwear fades, and our eyes and nose burn. When the pool water is too acidic, Chlorine is usually activated and lost to the atmosphere at a faster rate. Irritating black and brown stains are formed on the floor and walls of the swimming pool due to the sulfates that form from the corroding metal parts. At very low pH, metals usually corrode including pump connections, pipe fittings, and swimming pool equipment. Pool algae growth may be experienced after the pool water dissolves on the surface creating a roughness. This is more prevalent in a pool containing plaster or Marbelite. The pump is an essential component for the proper performance of the pool equipment. It controls and allows constant supply of clean water to your pool and safe functioning of the filters. The pump needs to be inspected more often to ensure that it is functioning well. Our specialists will help you to clean the pumping system. They will also advise you on the ideal horsepower and pump model suitable for your pool. The weir basket in your pool pump system collects big pieces of debris that were sucked in via the main drains or were missed by the skimmer. The weir basket prevents debris from accessing the pump system and clogging the impeller. The pool pump and weir basket should be inspected and cleared on weekly basis to prevent the problem. It is vital to eliminate all loose items around the swimming pool such as nets, ashtrays, and trash cans so as to ensure optimum safety and hygiene. Removing trash on weekly basis can help you to keep out dogs, trash, and leaves from the facility. This service is a top priority in our swimming pool cleaning services. Backwashing the filtration equipment is a crucial routine that helps to flush out excess debris from the equipment. Our skilled professionals are always ready to inspect and maintain your swimming pool filtration system. 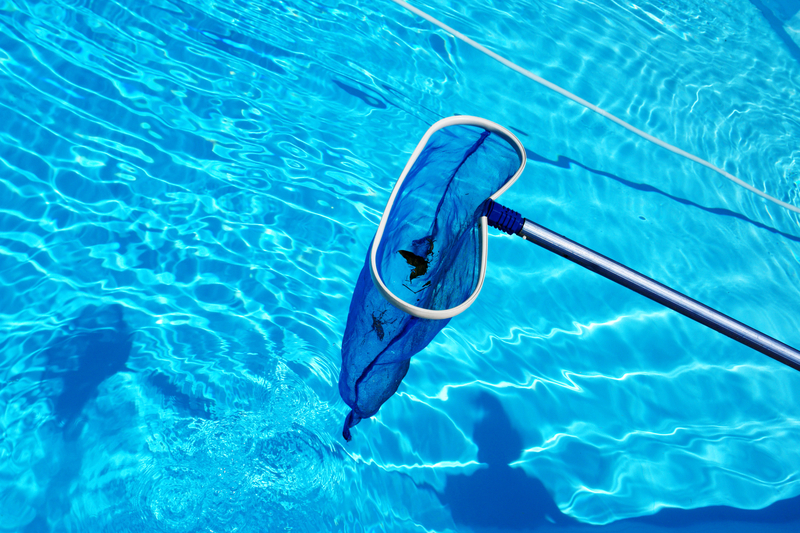 Scheduled pool cleaning services should include pump baskets and the skimmer clean-up to keep the equipment functioning smoothly. Our expert technicians usually remove skimmer and pump baskets, discarding any debris, to assure you of appropriate swimming pool cleaning. Clogged baskets create intense pressure on the pump equipment leading to more expensive repairs. We also use a special gentle tile cleaner to clean the tile surfaces around the swimming pool. The routine helps to remove the deposits of calcium or dirt that usually accumulate around the waterline. If your pool is used more often, it is vital to raise the frequency of cleaning waterline tiles. Removing dirt and calcium scales from the tiles is the best way to keep the pool water and the facility in the right shape. Brushing and vacuuming the pool facility is a fundamental part of scheduled swimming pool cleaning. We can either utilize our state-of-the-art cleaning equipment or your internal system to clean your pool. We also employ our swimming pool cleaning brush to dislodge the debris that has accumulated on the side and bottom of your swimming pool. Our combined brushing and vacuuming methods minimize the chances of having debris circulating throughout the pool. What Is the Importance of Pool Cleaning? Brushing your pool at least once a week leaves the facility sparkling clean. A clean pool facility offers the best place for relaxing. Routine and professional pool cleaning minimizes the need for repairs. Regular cleaning also prevents bacteria growth. Proper pool cleaning prolongs the life of the facility. Ensuring the pool is clean and in the right shape is the surest way to guarantee safety and hygiene to swimmers. We provide high quality pool cleaning services at the most competitive charges. Our expert technicians always follow internationally acceptable procedures when offering the pool cleaning services. Our customer support team is always ready to assist our clients. Before hiring our services, we always ensure that our customers clearly understand the details outlined on our pricing quotes. A majority of our pool cleaning services and plans are tailor-made to meet the needs of the average customer. We also offer specialty pool cleaning services including one-time cleaning, multiple cleaning every week, and fountain cleanings. In summary, you should only hire swimming pool cleaning services that best suit your personal budget and needs. We offer the best and the most affordable pool cleaning services. You don’t need to worry about hidden charges when working with us; we ensure that all our plans are as precise as possible. Contact us today to enjoy our executive pool cleaning services at the most customized charges.